I have a couple of questions regarding the calendar within P6. 1) If you are working on a project which starts with only a day shift then so far into the project a night shift is introduced, do you need to reflect this night shift work in the calendar? 2) What difference does it make to the schedule if you change the calendar apart from changing the activity durations? Changing the workweek is by itself a change in calendar related to how shift definition works. What happens if the shift definition needs to temporarily be outside the boundaries of the resource calendar-workweek? - Say resource calendar-workweek is from 6am to 4 pm and the shift definition needs to be from 2 pm to 9 pm during a specific period? How P6 handles such scenario? - I am not sure the shift definition will override calendar workweek. Maybe you will need to expand the resource calendar-workweek, a calendar change, and from there use several shift definitions, this should not be a big deal. Your question about calendars and shifts is of much relevance, the devil is in the details. With all due respect; In my opinion, the problem simply hides within the Planner. This I guess happens when you keep on trying to make the impossible becomes possible and you might forget that software(s) are just tools that do not or cannot even recognize the fundamentals of Planning and Scheduling. I believe that it is not difficult to understand that: Logic-Driven Activities are totally different from Resource-Driven Dependencies, and I guess you don't even need a software to prove this fact. Hence, in my example earlier (pouring of 1,000 cubic meters of concrete), you can even plan it over your own brain (if any), that you got no other option but to use a certain number of equipment that can give you the exact amount of output, that you have precisely calculated. Again, just my unsolicited opinion. Do you need to reflect this night shift works in the calendar? The resource calendar is used to determine when the resource can work; the limits for that period are determined from the shift definition for that resource. You define work shifts as suggested by Oracle as per following link. What difference does it make to the schedule if you change the calendar apart from changing the activity durations? The resource calendar is used to determine when the resource can work, if you change it you change when the resource can work. There are several other serious issues though. Primavera P6 cannot adequately model resource production rates [if at all] and therefore activity duration will be modeled as if different production rates among the different shifts do not matter. Try to model the scenarios under my post of Thu, 2018-11-01 16:10 if using P6 and see it by yourself. Resource leveling when shifts are used is tricky, error prone and in some cases errors unavoidable as shown in the following reference. Under certain circumstances shift resources will not be adequately leveled. There might be issues with partial workloads when using a single shift, when using multiple shifts the same problems can be expected. In my posting of Mon, 2018-11-05 09:23 slide no 6, such issues are illustrated using a sample scenario if using Microsoft Project. Because renewable resources are assigned as unit of effort but not quantity it is possible P6 will yield results similar to Microsoft Project. Currently I have no access to P6, I had it years ago, I have not been able to discard it does not happen if using P6. For the moment this question I see to remain open. Your e-mail was received but the e-mail server but did not allow me to open it nor download it. It is weird as I tried some test files for the temporary e-mail address and all worked fine; one test e-mail included a xer file as attachment so I am ruling out xer files are rejected by the system. An error message displays whenever I try to open your e-mail. I opted to close the temporary e-mail address, if need be a new temporary e-mail address can be created anytime. We will have to figure out other way, as we say at home “where there is a will, there is a way”. I will try to contact TempMail to see if we can figure out what the error message means and will let you know. Anoon, it is not necessary to have Spider Project for asking questions about Spider Project capabilities. Besides you can download Spider Demo and try it yourself. Please sent it to the following e-mail address I use to prevent spam. 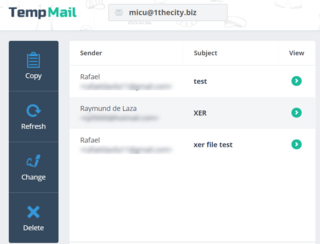 I use temporary mail from temp-mail.org It is a service that allows to receive email at a temporary address that self-destructed after a certain time elapses. It will only be available for a limited time. Within limited time anyone else who want to e-mail me their XER files can do so. Please let me know your email add so I can send it. Please post the XER file on a file hosting service so I can understand what you have done. It is impossible to verify it is same model by using screen captures if you do not have access to the software. Impossible if the original screen capture dissappears. If inadvertently using reduced availability and/or inadvertently using several other parameters different to the scenario requirements the model would not represent the same scenario. Among other parameters reduced availability can delay third activity as we all know. Involuntary errors do happen and must be ruled out. I do not have P6 license but can read XER files using other software or using a text editor. Dear Vladimir, Isn't construction technology the main problem of project controls? I mean if you don't use the appropriate technology, then how do you expect that "project controls" only can become effective? From my example earlier (pouring 1K m3 of concrete), it is by common sense that will make you believe that it is impossible to do it manually, therefore you will need to use the best technology. If it is not a part of "Project Controls" for you, then what is it? BTW, my name is Anoon (as in Noon), as I only wake up at noon, and Iimos (in my language, it means beggar, or something you gave to a beggar, when you spell it with L or "Limos"). It is not project controls by the way. we do not discuss construction technologies, we discuss problems of project controls. It looks like you shall leave PP and find another forum where the ways of pouring concrete will be discussed in details. Vladimir, Construction activities are real and precise. For example: Pouring 1,000 cubic meters of concrete can become a completely different situation when using completely different methods or resources. How do you imagine pouring 1K m3 manually as compared against using pumpcrete and truck mixers? So for me, the imaginary examples that you were talking doesn't make any sense (sorry). As a good citizen of this planet, I believe that it is your responsibility to educate idiots (like me for example). The audience should benefit more from you, and not otherwise. So come on, please be fair and show real examples. I can only see assignments on one activity not 3. With the available resources there is no overload if only one activity. It looks like you don't know what are the real schedules usually consisting of thousands activities. In other case you would not suggest Rafael to show them in the forum posts. It looks like you do not want or cannot describe the project for starting discussions on Spider Project capabilities. Please create new topic in the corresponding forum if you want to discuss something special. It does not look nice to discuss problems that are not interesting to the topic author and waste his precious time. in your new example budgeted units are 20 hours and budgeted units/time is 1 hour for each resource. Nothing common with the problem discussed. 1. Named Resource Pete is assigned to Planet Role A, Also Named Alberto is assigned to Planet Role B. 2. Named Resource Alberto is assigned to Planet Role A, Also Named Pete is assigned to Planet Role A.
Gentlemen/Sirs (Madams-if any), Sorry but why waste your precious times on an imaginary sample with imaginary activities and or resources when you can do a real one? (I had suggested). Rafael has been doing this for years and his sample projects were never finished (what a poor scheduling). Of course Resource-dependencies can be completely different from logic-driven activities plus considering calendar definitions for activities and resources. If they are all not consistent, then what do you expect? Oh come on! Will you show a real one please?! Please use named resources without using roles as most people do and show the results. If there were no difference betewwn roles and generic resources then one or the other is not necessary. If it fails to show same duration then there is an issue. If using P6 roles it shows different sachedule as if using named resource without using roles there is another issue. As far as I recall P6 role functionality is not the same as true skill replacement. It cannot even do the basic automatica substitution of one resource for another, it cannot do automatic replacement of a single resource with a multi-resource consisting of two resources as it happens when a single planning engineer can be replaced by two rookies working at a different production rate. Please see Page 29 of the following reference. The process does not allow P6 to automatically substitute one resource for another. In P6, your term generic refers to Role, either assign a Role or Named REsource, there is no difference. 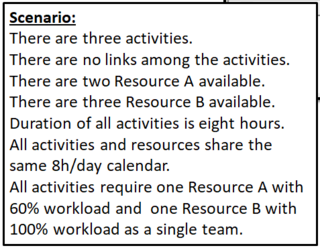 If you assign resource A1 to work 4.8 hours on one activity it is 60% workload but if you assign same resource to work his remaining 3.2 hours on another 8 hours activity this makes 40% workload, the requirement is to assign same resource 60% of his work time, not a combination of resources as it seems P6 is doing on the background. This is captured by most software if using named resources, most fail miserably if using generic resources. That P6 cannot properly level partial workloads can easily be shown with this sample scenario; if using named resources, no matter if using generic or named resources to same scenario the result must be the same. Generic resources are commonly used instead of named resources because at time of scheduling you do not know the mane of each resource as well as because it is practical it should not matter if a specific resorce name is Pete or Alberto, it still makes one single resource. What is the result if you use generic resources using P6? What is the result if you use named resources using P6? If P6 gets it wrong if using generic resources, P6 gets it wrong at the most frequently used methodology to assign resources. if activity budgeted units are 100 pieces, and assigned resources have productivity 5 pieces per hour (2 + 3) then activity duration shall be 20 hours, isn't it? P6 shall calculate activity duration basing on these data. But it is different in the screen that you published. Why? Besides, volume of work is activity property. You showed budgeted units assigned to resources (100 to each). Why? Yes, the assigned resource productivity shall be set as budgeted units per hour or per day, depends on planning duration. If budgeted units are set as physical units then assigned resource productivity shall be set as budgeted units per hour, isn't it? I would like to see the P6 scenario where activity budgeted units are 100 m3 and the job is done by two resources with productivities 2m3/hour and 3m3/hour. Very simple case. Workload means the percent of work time the resource is busy on certain activity. So in your example both resources (A and B) have 8 hours work day. One (B) if fully loaded on the activity and another spend on activity only 60% of work time (4.8 hours per day) and so have 3.2 hours of day work time that may be used for something else (for example on another activity that requires 3.2 hours per day of his work time). So resource A availability is 16 hours/day and it is assigned for 4.8 hours/day on each of three activities in Rafael's example. I understood that you want to test the tool and not my planning capabilities. Of course in this scenario you are the planner that wants to try new tool capabilities. Do it in Spider Project forum. Attached is the Screenshot of Resource Levelled using P6. Let me clarify the terms Workload and Quantity in your Sample. As I understand Resource A (2#s) is working for only 4.8 hrs out of the 8 hrs/day and Resource B (3#s) is working full time of 8 hrs out of the 8 hrs/day. Vladimir, Yes, let's stop it here. I hope AT got his answers already. One thing maybe worth to remember, when you're dealing with a dynamic schedule, once you made additions, subtractions and or variations to it, then you may need to adjust anything associated with it as well, otherwise the results may come out not as what you have desired. BTW Vladimir, If I give you all the details you wanted for a schedule, then that would make me the real Planner, and you as the Data Encoder only (and I don't think you'll like it:). This I guess is what's really happening in the real world, especially for complex projects. this became pointless discussion. Of course any software is management tool and makes calculations basing on entered data. You wrote that you want to see how Spider will model your project but do not want 1) start this discussion in Spider Project forum, 2) describe your project in details to avoid different understanding of what do you want to model. If you are interested in learning how Spider Project models some projects or situations that you may suggest, make the proposals in Spider Project forum. It does not make sense to continue here. Vladimir, That's exactly the point I wanted to make. Any software can become useless if there's no data to feed in whether correct or not. If the operator (the so-called Planner or Scheduler), have no idea how to build what he/she is supposed to schedule, then what do you expect? Even if you give them the very best software ever created (if any), you can never expect that they will give you the best output as well. Now, if Spider and P6 may perhaps use the same engine (or algorithm), and you input exactly the same data, then what would be the difference in their own outputs? I guess nothing, unless you prove otherwise. I can accept the schedule created in any tool including Excel and will show how it looks in Spider Project. You may also suggest to model uncertainties in volume, duration, productivity, costs (or anything else) suggesting minimal, expected and maximal values and risk events that may happen with expected probabilities. For risk events describe the impact - what they will change in your project if happened. I will be glad to enter your information in Spider Project and show anything you may require in Spider Project forum. Vladimir, I'm beginning to suspect that Spider can only do what may be P6 can do the same or even much better. If you think you cannot model automatic resource leveling in one bored pile, then you can make 2 bored piles at the same time. It's just a sample anyway. We shall see if how accurate Spider schedules real construction projects. BTW, sorry, I'm just using a very small screen mobile, so its difficult for me to respond quickly. And of course I don't have any scheduling software of my own so I cannot show you any sample. I did not state that the project that you proposed is simple, I stated that it does not include resource leveling because project resources are not involved in a number of parallel works. Vladimir, Of course it is, a bored pile may look so simple, but in fact it is not. Please give it a try and we shall see. You might consider some scenario of cave in (hole), so you may need to apply some solutions and for concrete pouring, you need to sequence it properly, otherwise, you may end up rejecting the concrete mixture, or worst, may condemn the whole structure and start all over again. And of course it has steel reinforcements, and provision for testing (necessary - otherwise, you will never know the integrity of the pile). 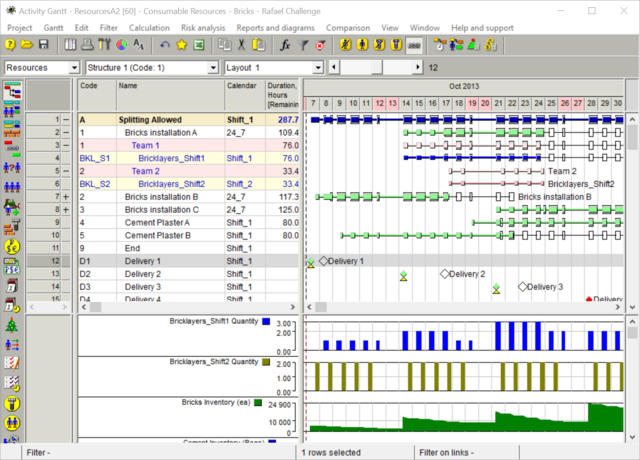 That's why I want to see, how you practically model it and schedule using Spider Project (and P6 for Raymund). I won't give further details until you asked for it (like what a Planner practically do, as Mike said, you cannot plan it, if you cannot build it). I just accepted your challenge, remember? No thanks for now. my questions and answers to your answers are below. Do you measure budgeted units in meters, tons, cubic meters, etc.? Concreting may last several days if the work calendar is continuous. I meant other case. Planning Skills of a Technical Planner and Scheduler shall be used in creating realistic project schedule. The job shall start when minimal requirements are met and if additional resources will become available they shall join and accelerate activity execution. If IT tool does not plan like people do it will not be used for practical planning. Productivity of the crew depends on the number and productivity of crew resources. Planning Skill of a Technical Planner and Scheduler is required for creating adequate project model that properly reflects project technology and constraints. IT tools are used for calculating the best project schedule that meets all project constraints. If people can do it better than the tool then the tool is poor or it is not the scheduling tool. Foremen are usually assigned to the hammock activities. It is modeled. 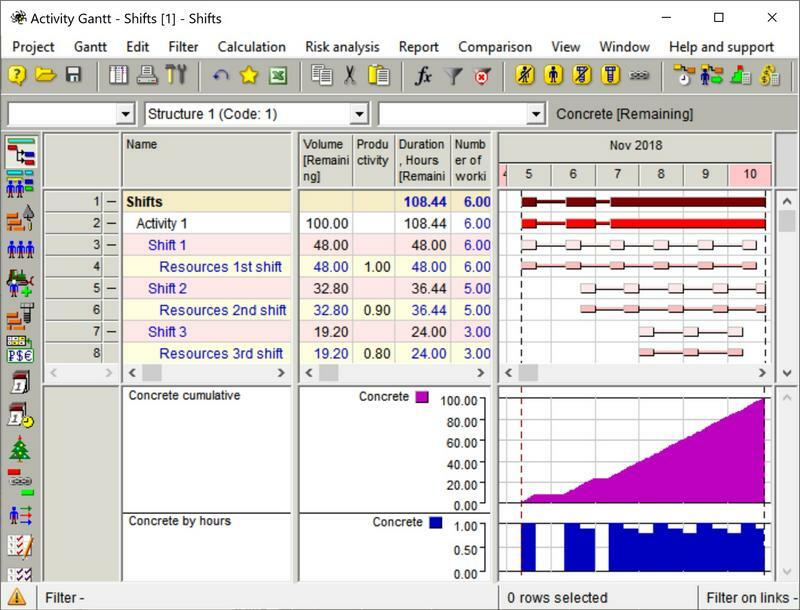 In order to follow how you relate partial workloads and resource quantity please show how you would handle the sample 3 activities scenario shown in slide 6 of the following presentation using generic resources as well as named resources. If you schedule the work to happen within same day the software shall warn you of resource quantity overload, otherwise it is unreliable. What it is showing? If you use P6 automatic resource leveling will it get reliable results? one bored pile is not an example that may show software leveling capabilities. Leveling example requires activity competition for constrained resources and so it shall include activities that may be done in parallel but require the same machines or specialists. So please suggest something else. In Spider Project Demo that may be downloaded from http://www.spiderproject.com/index.php/spiderproject/spiderdemo there is sample schedule of 1km road construction. Though this project does not contain work in several shifts it may be used as an example of detailed planning that includes resource leveling. It would be interesting to see the same model in P6 or MSP. we use activity volumes in physical units and calculate activity duration basing on assigned resource productivities. P6 has Budgeted Units (Quantity of Work) and Calculate either the Duration or Productivity rate upon setting up the Duration Types. P6 can generate number of Workers from the inputs of Man-Hours or Man-days per Duration. Concreting may take more than a day and continuously until the element is completed; for example such as Raft foundation of a high rise and slip forming casting of a Silo. This is a Planning Skill of a Technical Planner and Scheduler. But not the IT Planning Tool user. In my experience, I assign Quantity of Works and Unit Prices to generate the Planned Values. This is where the EV is obtained. In my experience, I assign a Crew for a certain Activity. The Crew may consist of Foreman, Skilled and Unskilled. The productivity of the crew and number of worker per crew is obtained from experience. we try to create the shortest feasible schedule taking into account resource, cost, space and supply constraints. The above is Good for Manufacturing and Construction. I am actually referring to a Resource (Material, Labor & Equipment) that will be assigned to different task in which for example the Foreman shall man the Steel Fixing then go to other area to man the Formwork then go to the office to verify the drawing then go to the other structures with ongoing casting of concrete. These cannot be modeled in a construction schedule. As I explained above, P6 can also function as what you say it can be done in Spider. Raymund, Please visit the "Hijacked Discussions by Rafael Davila". You can post your sample project there (I guess with Rafael's permission), I mean using P6, resource loaded, and automatically leveled. You can use my data for construction of 1 bored pile (already posted there). Please prove to Vladimir and Rafael that P6 is very much more superior than Spider Project. I can't do it myself as I don't have the software and I'm not really familiar with P6, I only do manual scheduling, but if you have any questions, please don't hesitate to ask. maybe we have different experience. We plan construction works as people do considering all factors that people consider when schedule their work. What of the above is good for manufacturing but useless in construction? And please show us how "P6 can also functional with that examples." I am using the P6 for several years and its quite performing excellent for the purpose. Resources such as Materials, Labor and Equipment are also loaded but users are less interested on what output they may gain apart from when will the Resources are needed at site. The examples of Rafael and Vlad are excellent in terms of Manufacturing Industry where Hours or Minutes duration are used. P6 can also functional with that examples. Frankly, in Construction, their examples will not work out. I'm just wondering why P6 users still keep on silent even when this two Spider Stalwarts keep on mauling a poor and innocent scheduler who haven't even used P6 for almost a decade? I guess there are three reasons: 1. P6 is really flawed. 2. Or the reasoning of the Two Gentlemen-Stalwarts were not worth a peek (ouch! ), and 3. P6 users have never get matured and educated, thus, just making a very expensive software act as just a drafting tool drawing schedules. No wonder why most companies (even top tiers) just switch to MS Project (MSP don't understand how to update and maintain schedules). Or is it that, the importance of Planning and Scheduling is still not really understood within the business and industry? I did not understand why an approach that suggests to represent Concrete Foundation not as one activity but as several activities with different volume units, crews, productivity may be considered as the sales pitch. Of course P6 can be used for modeling and automatic resource leveling but with certain restrictions. The model will not be the same as Spider model. In Spider Project we will enter volumes of work in physical units (tons, sq meters, cubic meters) and activity duration will be calculated taking into account assigned resource productivity, and Spider Project will delay concreting to the beginning of the next day if it will not be able to finish the same day with the start. Spider Project will also model work in several shifts. I suggested before and repeat my proposal: describe your project in details (or show its schedule created in any tool). An example that I have shown in this thread was created today as an answer to your request that I did not fully understand. So your statement "Please don't show other examples that you've shown perhaps several times already and I guess no one bought" is not correct. If you want to see how others would schedule Concrete Footings I suggest you create a separate discussion, if you want to make sure Spider Project users get into it then create the discussion under Spider Forum. In this way we will avoid hijacking the discussion away from A T, the creator of this discussion. I will keep posting examples in this discussion related to the main topic initiated by A T - calendar changes and shift models. I will avoid as much as possible not posting here examples that are not related to the main topic initiated by A T. Usually Concrete Foundations is an activity that can be scheduled without the need to use more than one shift, partial workloads on some assignments will do it. At times a single activity will render better model, at simes several activities are needed to get a better model, this we can discuss under separate topic. If I remember correctly, I guess we had the same discussions around a decade ago, that's why I requested the modeling of a simple activity called: Concrete Foundation. If it does not need to be broken down into measureable and discrete activities (and applied with automatic resource leveling) and come out with accurate results using Spider Project, then that's what I wanted to see. However, you both answered otherwise, and ideal principles which I cannot agree more (so it seems sound the same sales pitch to me, Sorry). Honestly, I haven't used P6 for almost a decade as well, but based from the principles that you have clearly stated, I believe that you can do good schedule model and apply automatic resource leveling using P6 and come out with a result perhaps have no difference than what a Spider can do. That's my opinion. If were to model the said activity (Concrete Foundation) using P6, I would even consider fabrication works (separately), and even striking of formworks or even quality inspection works. And for sure you knew that concrete pouring itself (depending on the volume) may only take a couple of hours or so. I only want to see (and perhaps many other members of this site as well) how do you exactly model the mentioned activity (concrete foundation) using Spider Project. Please don't show other examples that you've shown perhaps several times already and I guess no one bought (but I loved the background music anyway). Please? Anoon, you wrote: I guess P6 can always do the same. 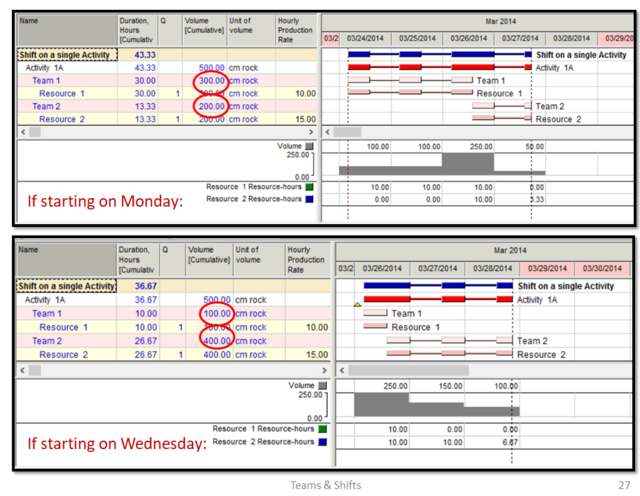 P6 calculates poor resource constrained schedules and a lot more. - activity duration does not exceed 2 weeks (preferably one week). Exceptions shall be rare and for activities which volumes were defined. It is not possible to show real project models consisting of thousands of activities in the forum message. So we discuss approaches, methods, capabilities. If you suspect any manipulations just download Spider Project Demo from http://www.spiderproject.com/index.php/spiderproject/spiderdemo and try everything yourself. Any questions are welcomed in Spider Project forum. Installation of Materials are consumable resources that represent volume of work, if used on same activity they represent different volumes of work on same activity. Same as regular renewable resources they must be leveled, if not available activity execution stops. Because their installation is a function of brick installation it is enough to model Bricks volume of work for activity, you shall be able to view materials installation/consumption within a view or a report. Now we are talking about models a tad less easy. A detailed discussion of this belongs to different topic. In this scenario materials are to be delivered once a week by barge to a remote island. Apologies to A. T. who started this thread, I just hope you enjoy the discussions (I like Rafael's background music). Vladimir said: "Activities with different volume units and assigned resources shall be shown and calculated separately in the detailed schedule". While Rafael said: "Once you got a good model, automatic resource leveling comes at a single click, a piece of cake". Well, I cannot agree more, but I guess P6 can always do the same (as exactly based from your own statements that I quoted). So perhaps it again boils down to how detailed a schedule need to be to arrive to the best model where you can do resource leveling at a single click. In other words, if your schedule (or activities) is not discretely measurable, then it is not a good model, therefore when applied with automatic resource leveling, may always come out with eroneous results. The thing is: When you are working with a multi-disciplined, multi-contractor and or multi- specialty subs, then how can you create a good modeled overall schedule? From real life experience for example: In High Rise Building construction, they normally use 1st Fix, 2nd Fix, Final Fix as activities for Electro-Mechanical works, so of course these are not applicable, but these are what management wanted to see. In Oil & Gas plants, you may use Inch-Dia or Inch-Meter for piping works which a bit measurable (but very confusing sometimes), however, fabrication of piping spools, vessels etc. maybe done in another continent so how can a poor Scheduler on site create a good model for a schedule? In shutdowns / Turnarounds, how do you measure activities like degassing, pigging, putting spirits or detergent, gaskets, blindings etc. etc. etc. and apply automatic resource leveling? Once you get a good model automatic resource leveling comes at a single click, a piece of cake. Creating models for different shifts on same activity is usually a piece of cake if using Spider Project. I expect it to be the same if using P6. Needless to say that more complex scenario can be difficult but my sample scenario is easy, it is about a single activity, cannot be any easier. As I see it, it is just a matter of learning how to use the software. If not that easy, that is fine, what is not acceptable is that you cannot model different shifts on same activity and get reliable results without using manual adjustments. Artificial splitting of activities is wrong, no matter the purpose. Fair enough for me. Thanks Gentlemen. However, I for one believe that even a single unit of scope may need to be separated depending on crew, equipment, price and sequence necessary. For example: Rebars or steel reinforcement maybe measured in terms of kilograms (kg), and Formworks maybe measured in terms of square meters (m2) and Concrete is in cubic meters (m3), and they all boils down to cubic meters or volume of concrete. What I'm trying to say is that: even rebars and form works have their own unique unit of measures and perhaps prices, they may need to be separated within themselves. Why? Again, for example: There maybe completely separate activities involving exactly the same material, and may as well utilized completely different equipment. Another Example: Fabrication (maybe in shop or on site), and Installation of course on site. And you don't only bite these materials but of course you use some kind of equipment in order to utilize them and serve its purpose. So who's saying that automatic resource leveling is a piece of cake? Come on, please show us some realistic thing and not just an imaginary activity (which maybe manipulated). The following video showcases how artificial splitting of activities can yield undesired results. If Activity 1 is split but its execution shall be contiguous depending on resource demand and availability resource leveling might or might not schedule undesired non-contiguous execution of sub-activities. If you add resources A then it might schedule contiguous execution of sub-activities. It might be that initially sub-activities are scheduled contiguous but if delayed they might be scheduled non-contiguous. The might or might-not must be eliminated in order to get a good model, you eliminate it by avoiding artificial splits. Artificial splitting of activities is not a good practice, unfortunately there are many who promote the contrary by requiring all activities to meet some maximum arbitrary duration, the workaround being artificial splitting. on the screen below one activity that is done in three shifts. On the 1st day only shift 1 is available, on the day 2 shifts 1 and 2 are available, on the day 3 all shifts are available. Activity has 100 units volume. Productivity of the first shift is 1 unit per hour, second shift has 0.9 units/hour and 3rd shift 0.8 units/hour productivity. They work until the whole activity volume will be done. Let's assume that they spend some material with the name of concrete 1 unit per volume unit. Diagrams below Gantt Chart show material consumption per hour and cumulative. I don't know if understood you question properly. And I agree with Rafael that activities with different volume units (and assigned resources) shall be shown and calculated separately in the detailed schedule. The example I provided is for a single unit of work that drives the activity duration. If there is another unit of work that drives activity duration in such case their volumes of work are not incidental but independent, if two independent volumes of work it makes two activities and merging the two into a single activity will be as wrong as splitting the activity in my example. Ok, maybe not fair enough, but that's real life anyway :). In my opinion what Rafael is saying "Maybe" or only applicable to single unit of scope, but not for activities involving multiple units of scope like concreting for example. Please confirm Rafael, come on! Be fair. Same as Vladimir I cannot follow your request but It is enough to show the one activity sample schedule I already provided. It is a no brainer, if activity start moves so do shifts start, because shifts have different production rates the activity duration changes. If you split the model into two activities in no way the model will make the adjustments as it will not know what volume of work is to be performed by each individual activity. If the volume of work is kept within a single activity the volume of work remains 500cm. Please turn on the volume, the music is on the house, expand to full screen for a better view. Please take a look at my Fri, 2018-11-02 18:43 post for a static view. Activity will take 3 days 3 hours. Activity will take 2 days 6.67 hours. After all work is done no need for resources to hang around doing nothing, they will be realeased and become available to do work on other activities. There is no problem Vladimir. I'm just quoting Rafael who said: It doesn't make sense to break up an activity involving multiple crews and or shifts as it may result to erroneous automatic resource leveling. As I believe Rafael always have a better way (if not the best) to do scheduling. So if you may kindly please show planning planet community if how you actually do it in real construction activity like for example: Concrete Foundation. Without breaking up or granulating the said activity, please show us how you assign multiple crew and shifts and arrive to a realistic schedule (in your simplest and quickest way and of course, accurately). Many thanks in advance. I don't understand what is the problem to be solved. Please explain suggesting the detailed example. For real life example: Firstly, you got a simple activity called Concrete Foundation. One activity, resource loaded with several crew and shifts for example. This is a challenge to Rafael and perhaps Vladimir (though I got nothing to bet). Please show us how you schedule it correctly using automatic resource leveling. And please explain further on how you have considered components such as the following: Earthworks, Formworks, Rebars, and Concrete. Simple as it is and may make people's belief changed in an instant perhaps. Breaking up activities does not make sense when different teams work on the same activity. Splitting the activity is a very poor work around when different shifts work on same activity. When you split a resource loaded activity because other activities might be competing for the same resouces there is a risk each sub-activity will be scheduled non-contiguous by the resource leveling engine. If not enough re-distributing the volume of work among the sub-activities and calculating their adjusted durations every time these are delayed as schedule moves will be a nightmare. Learn to schedule shifts within same activity using your software, no big deal, should be easy. Question no. 1: Yes of course as you introduce new resources, correspondingly, adjustments to the schedule and or calendars would be necessary. You might consider breaking up some activities while shortening durations and accommodating several shifts. Question no. 2: Additional workforce or resources would mean additional cost. However, Time also means cost. So I guess it is just a matter of balance between time and cost. Which one is economical without sacrificing quality and the committed completion of works. not necessararily it depends if you are tacking and manloading the schedule. A working day is still a day no matter if it is 1 or 4 shifts it how you want to represent it. it depends on wht changes you make to the calendar. For example if you add holidays that reduces the available number of working days for that particualr month. Thus reducing the available overall time frame for the project. 1. you may create a seasonal calendar maybe you can only plant during the fall and spring. Then you assign planting activities to this specific calendar which means that the planting activities can only happen in the spring and fall window. 2. Maybe your job shuts down during the winter. Then you would block out the winter months in the calendar. That means that now work will be shown during the winter months. 3. Maybe you project closes from Christmas until after the new years. That means no work will be shown during this period. bottom line it all effects the calacualtion of total float. Be reminded that usually work on different shifts is scheduled at different hours per day, using different crew with different production rates. I do not know how P6 deals with such scenarios but the need to model team assignments and independent assignments is essential to model shifts on same activity.